The big-size model for industrial use achieves steady production of large volume. Hopper has magnet with 1000 gauss, the standard feature for exclusion of foreign item. 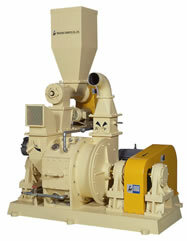 Main body is built with cast iron of special strength for noise-reduction purpose. As option, body composed material is to be selected such as stainless steel on powder tangible section for food production, or ultra-hardened iron for extra-hard material.